A new experience for a New Year! For the first time, take to the skies with our new mouse-controlled flight experience—no joystick required! Join as we roll out this and other new features. Our development team is hard at work bringing Fighter Base to life in 2018! So go for a loop or two, and, If you have feedback, let us know what you think! Install our new Launcher and never need to download another client manually again. Yes, it’s finally here, the automated updater. 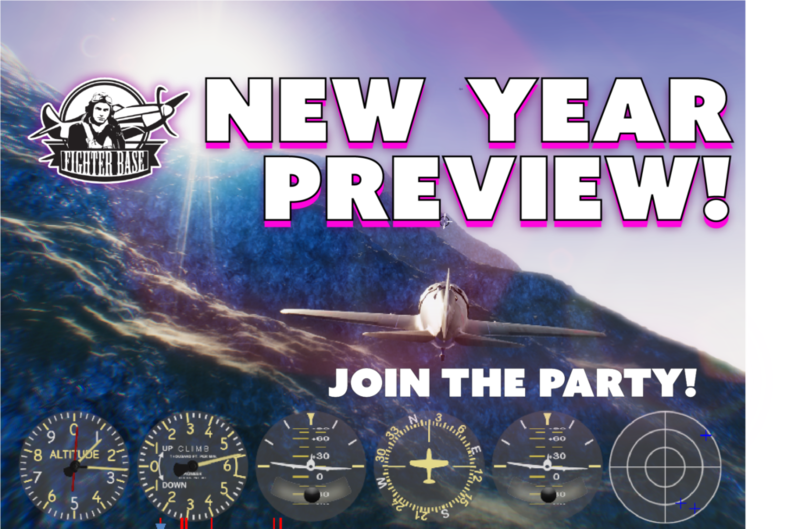 After this weekend you will be able to just click on “Fly” and let our launcher get you directly into the air. No more downloading and installing. There is a gate in the air. Fly through it to uncover a Race Track in the sky! When the player passes it the right “green light” direction then the race is on. There is limited time to reach the next checkpoint so you need to hurry. Depending on arena settings, other players may be able to shoot you down in so keep an eye on your 6. Individual times are tracked in a leaderboard all weekend to determine who the best pilot is. Special events will feature concurrent multiplayer racing. Death bowl is back and it’s better looking than ever. You start in the middle of the killing zone and there is no escape! It’s a kill or be-killed inferno and you’re the main event. New to Fighter Base – in-game voice communication! You can speak with your squad-mates as long as you are not playing on different teams (for team games). You can now spot those bogies from a mile away. Need to find the next race gate? The Radar dial is your new best friend. Not available in all arenas but a lifesaver in a furball. You missed it? We brought it! Gun convergence. Just click on the new Tuning button next to he aircraft and adjust to your heart’s desire. Session times to be announced. In addition to the organized sessions, there will be free flying all weekend long. As a bonus competition, the squadron and individual who rack up the most points over the weekend will be declared the winners of the event! PLEASE NOTE – A client update is required, so visit www.Fighterba.se the day prior to the event to update your client.